The Top Yard team at the St Ives show. From the left they are coach Majid Romani, Mustafa Rafiq, Fazan Khalid and coach Hamad Javed. Top Yard School of Boxing star Fazan Khalid keeps on winning. The Peterborough fighter made it eights wins out of eight when appearing at the St Ives Boxing Academy dinner show in Huntingdon on Saturday. He came up against Harry Blackhall from Chalvedon Amateur Boxing Club and it was his toughest fight so far. Blackhall was shorter and stockier and came to fight and with 18 contests under his belt he was clearly Khalid’s most experienced opponent to date. He pressured Khalid from the opening bell and dragged him into a war forcing his gameplan out of the window. Khalid started to box a little better in the second round keeping his range and landing the cleaner shots. However, it ended up a slug fest again. Both men began to tire in the final round and it was Khalid’s toughness that saw him through to take a unanimous points decision in what was a very close bout. 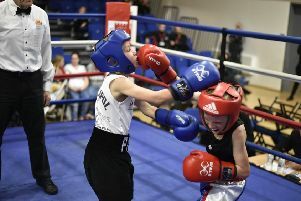 Top Yard’s Mustafa Rafiq was also in action and was gunning for revenge against Jack Hughes from Norwich Lads ABC. Hughes is the only man to beat Rafiq and when they first fought it was very close. And so it was again. Rafiq turned in his best ever performance and looked slick in movement and landed classy shots throughout the bout. Hughes threw many wild hooks in return which worked for him at times. The first two rounds were very close and all hinged on the last round. Rafiq started brightly and looked busy. However, a lapse of concentration in the final 30 seconds allowed Hughes to land three or four cleaner shots which tipped things in his favour on points.